I don't know if it is possible for a wall to be famous, but this wall, which was fittingly created by The Most Famous Artist, has made an appearance in quite a few blogs. I was so enamored by the wall that I did a Google search to find its location. 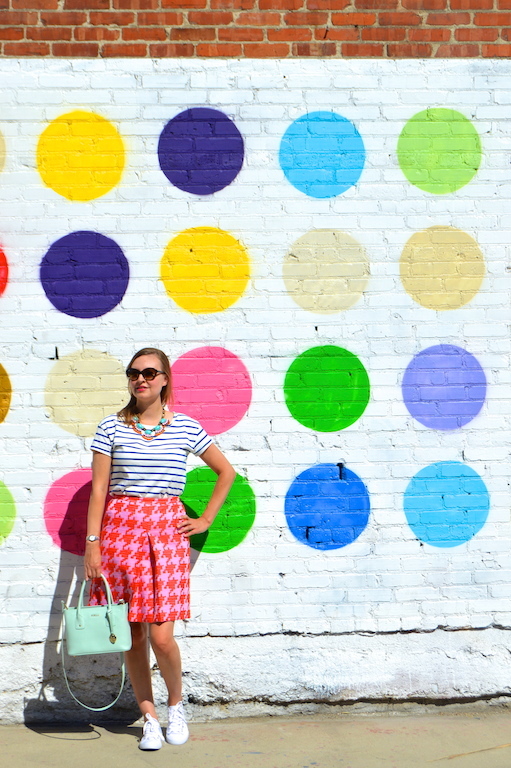 In my search, not only did I find my majestic polka dot wall, but a guide to many other cool walls here in Los Angeles. Last weekend, my husband attended an event in the Arts District of Los Angeles, which is where this wall is located, so I had to stop by to take a peek and take a few pictures. 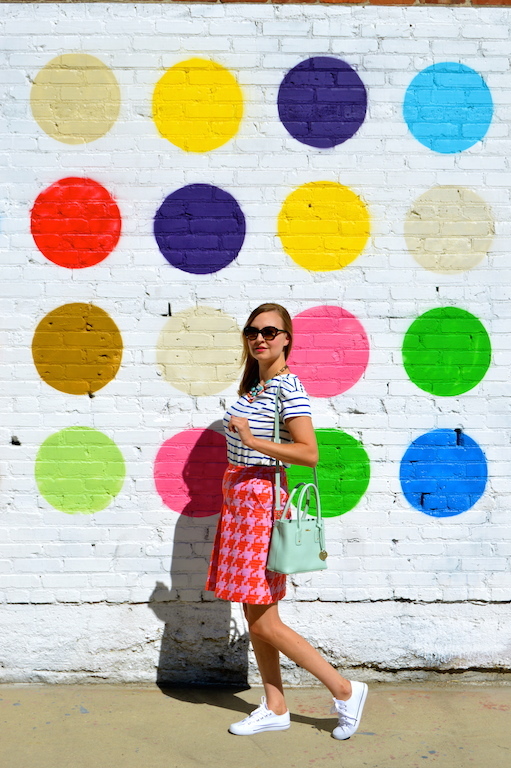 Now that I've found this beautiful polka dot wall, my quest is to locate some others on the list of "cool" and "famous" walls in the area. Next on my list is one that is painted to look like a Modrian! 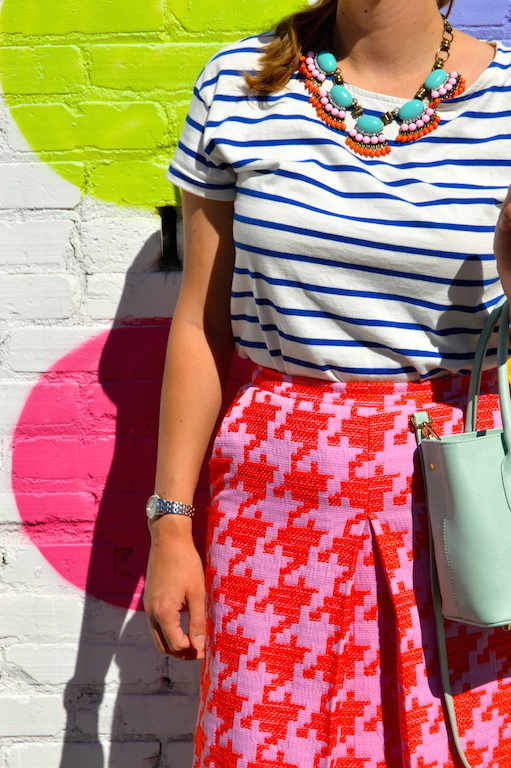 Stripes and polka dots and a patterned skirt - fabulous! That's really fun. You're like a living piece of art against painted artwork. Thank you! I tried to plan out something fun and cheery to wear against such a fun backdrop. I love the idea of being a living piece of art against art! Very fun backdrop. You have it made in the shade with all the cool places to take photos in LA. LA definitely has some of the best locations (and walls!) for photo shoots, but I never seem to find the time to see them. I guess that's why it was such a treat to do a photo shoot at this particular wall! 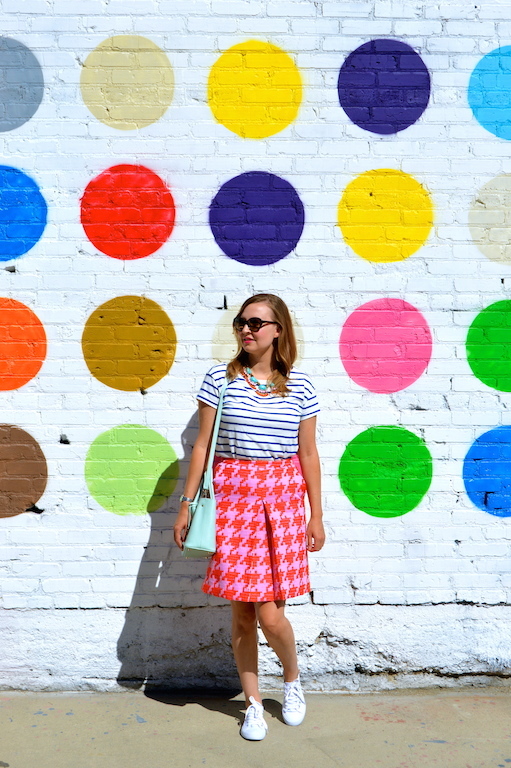 What a gorgeous rainbow polka dot wall. 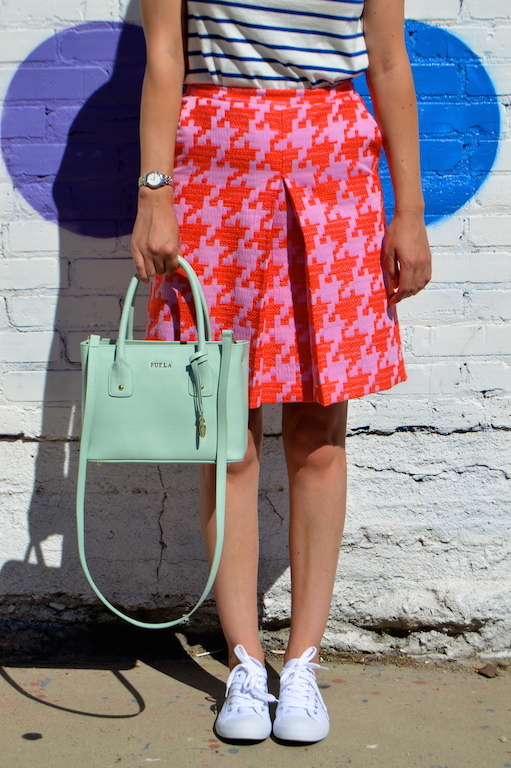 And you know I love the red houndstooth skirt. Looks great with the white sneakers. Thank you! I never wear sneakers with skirts, but I thought it would be sort of fun. Plus, we did a lot of walking that day, so they were practical as well! Beautiful wall, I love the multicolors. Perfect for your lovely outfits, cute look. Glad you found the wall. Thank you Rachel! I definitely want to go back to this fun and festive wall in the future. It really is the perfect place to take pictures that "pop"! This wall is so fun! What a great place to take pictures!! Thank you! I think it could easily become my new favorite place for photos! Your outfit is such fun. 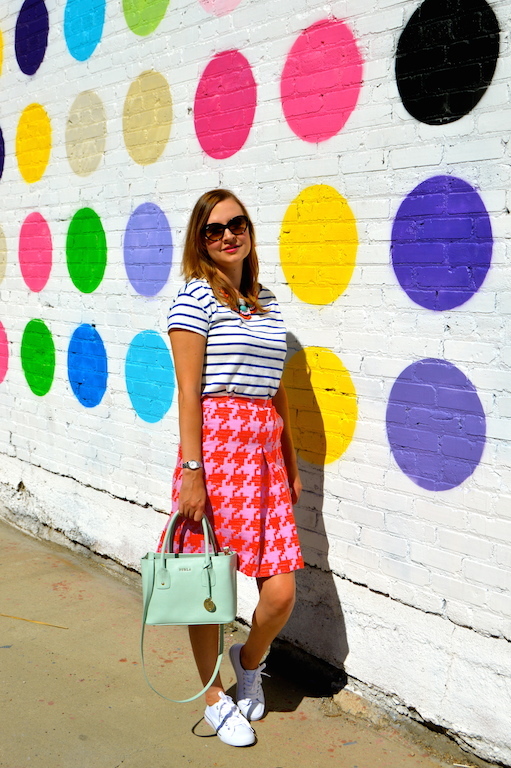 Love the strpes with the textured patterend skirt and the coloured polka dot wall is the perfect background! Thank you! 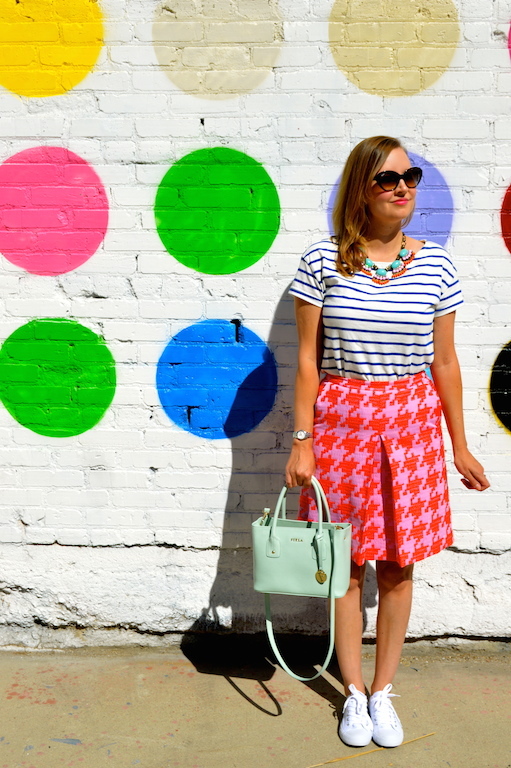 I did put a little thought and planning into making sure my outfit matched the playful and fun vibe of the wall! LOVIN' all the color! Pretty photos and fun wall! !